...what does one DO with a bushel full of grape tomatoes? So I haven't taken a lot of pictures of the veggie garden we planted this year, but the tomatoes are no less plentiful than they were last year...they're just a bit smaller. I thought I would be one of those mommy bloggers and plant a vegetable garden with Little G. We would carefully place the seeds in each compostable container and water them with love and then the plant would grow big enough to put in the ground and someday when we had beautiful, plump, red grape tomatoes, we would cheerily pluck them off the vines and gobble them whole letting the juice dribble down our chins. Yeah. That never happened. If I recall, Little G only wanted to dump the dirt out of the pots, wanted to pull the plants out while we were watering them, and so far has yet to eat even one tomato - although he has bitten into them and then promptly spit them out at me. So, since my husband doesn't eat tomatoes either, I have been in charge of eating a HUGE amount of grape tomatoes every week. The picture above is NOTHING compared to the harvest I pulled in just before the hurricane the other day. 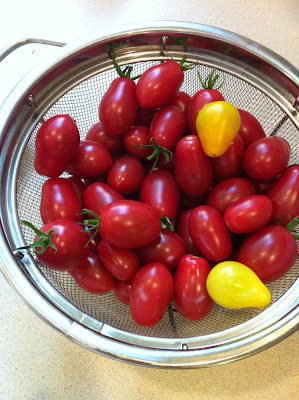 And desperate for something to do with the hundreds of little tomatoes, I decided to improvise. And BOY did that work out great!! Of course, since I was improvising, I took no pictures, so you'll have to forgive me for yanking these pictures from other sources to help with the story of the world's-most-awesome tomato sauce!! Basically, I washed the tomatoes, tossed the bad ones, and sliced each of them in half, lengthwise. I placed them all on a rimmed baking sheet and sliced up some onions very thinly and placed them on top of the tomatoes. Then I drizzled all of it with olive oil and sprinkled it with salt and pepper. 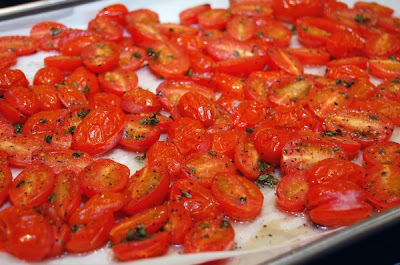 I roasted the tomatoes for an hour at 300 degrees and they came out all shriveled and concentrated and yummy. THEN I put all of it in the food processor with some fresh basil leaves and processed those suckers into quite possibly the most amazing tomato sauce I have ever produced. It was a bit thick...slightly less thick than hummus, but still...so intense in flavor I could have eaten it with a spoon. 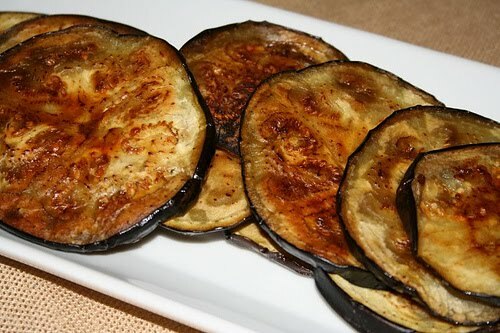 Instead, I decided to continue improvising and sliced up some eggplant (since I hate eggplant and never know what to do with it, I figured it wouldn't hurt to sacrifice it for this recipe) and threw it on a baking sheet with olive oil and salt and pepper and roasted that for 2o minutes at 400 degrees. When it was all done, I layered the sauce and the eggplant with some mozzarella cheese and some parmigiana cheese in a small baking dish and then tossed that in the oven at 400 degrees for twenty minutes. The resulting dish was nothing less than FREAKING FANTASTIC!!!!!!!! It was a bit soft...as in, not too much bite, but the taste, OMG the taste! I can not believe for the life of me that I made something so darn yummy from all those darn tomatoes! AND...ha HA...guess who scarfed down my tomato sauce like there was no tomorrow? Oh yeah...Little G. How ya' like THEM tomatoes, huh?? Have you ever stumbled your way into an awesome-sauce sauce? Yes! Borne from the same problem you had, TOO MANY tomatoes and a patch of overflowing basil! 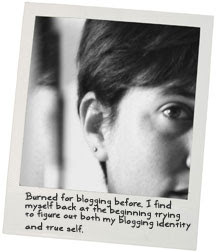 I googled my heart out until I found a recipe that uses red wine as the base and fell in LOVE. I'm going to have to try this. I've been searching for months for a perfect tomato recipe, with no luck. 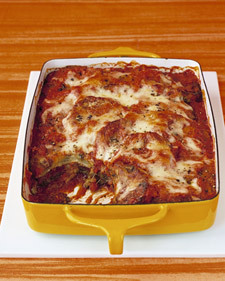 Especially since my friend scolded me for using jarred sauce on my eggplant parmesan. As a matter if fact, my husband DID eat it and liked it! It's officially in the rotation...and FWIW he's totally a meat and potatoes/ vanilla ice cream kind-of guy, too.